This post has 592 views. 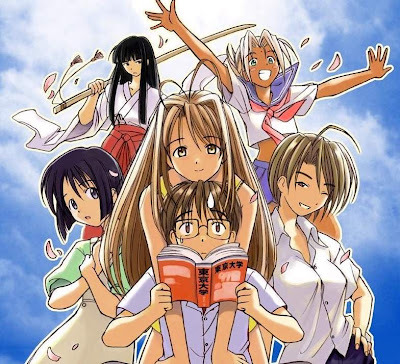 Love Hina is centered around Keitaro Urashima, a cram-school student who tries to get into Tokyo University in order to fulfill a childhood promise to a girl. After failing the entrance exam twice, Keitaro is kicked out by his parents and ends up becoming the manager at his grandmother’s Hinata Inn, which has been converted into a girl’s dormitory. Keitaro now has to deal with the sometimes hostile female residents of the dorm while continuing his quest to get into Tokyo U. In terms of plot and characters set up, Love Hina follows your classic harem romantic comedy formula. We have Keitaro, the typical lovable loser protagonist, who is thrown into a situation were he often interacts with a half-dozen of attractive female characters. All the girls initially hate Keitaro but they eventually learn to tolerate him and even start to develop feeling for him. Even though Love Hina is billed as a harem series, Keitaro’s only real romantic interest is Naru Narusegawa. The most the other female characters can do is to distract Keitaro or delay him for a bit, but Keitaro never actually wavers from his resolve to win Naru’s heart. This means that there’s never really any doubt about who Keitaro is going to end up with, which I feel takes out some of the fun from reading a harem romantic comedy. (Oops, did I accidentally give away the ending?) It certainly wouldn’t have hurt if couple of the other girls were given a real shot at Keitaro. Other than Keitaro and Naru, all of the other characters have one dominant personality trait and that’s all. The supporting characters all have one thing that they usually do, and they never evolve beyond that. I suppose the author wanted the story to be like this so we can focus on just the male and female lead, but it would have been more interesting we had some real character development in the supporting cast, or maybe have a few more leads like I was saying before. As for our two leads, Naru is the more interesting of the two because of her indecisiveness towards Keitaro. Naru can’t quite admit that she likes Keitaro, and a good portion of the story near the end is about her trying to run away from Keitaro more than once. The running-away story works the first time, but after that it gets old. Now that I’m done complaining about the series, I have to acknowledge some of its good points, which is its comedy and artwork. Love Hina is a lot more focused on the comedy in “romantic-comedy” than the romance. The series is filled with slapstick comedy from all of the characters, although the most frequent scenario involves Keitaro being sent flying by Naru. There is also presence of outrageous plot turns and sci-fi/fantasy elements which makes the somewhat formulaic story more fun. The artwork in Love Hina is also quite nice. The art style is simple but it is pleasing to the eye, and all of the characters are designed well even though some of them don’t have much a personality. Love Hina is overall a decent read. It stands out among other works in its genre because of its outrageous comedy, but the story and characters aren’t as strong. If you like slapstick comedy and don’t mind a bit of romance, then Love Hina would be a good series to read. Those looking for in-depth romance should probably look elsewhere.